© Estate of Eduardo Paolozz. All rights reserved, DACS. In 1949 Paolozzi took up a teaching post in the textiles department of the Central School of Arts and Crafts in London. It was here that he began to experiment with screenprinting and over the next few years he made a large number of collages using sections of cut or torn paper from large screenprinted sheets of irregular line and dot patterns. Colour was added to the collages using opaque and transparent paint or ink. Or as in this work an existing collage was unified by a screenprint overlay. 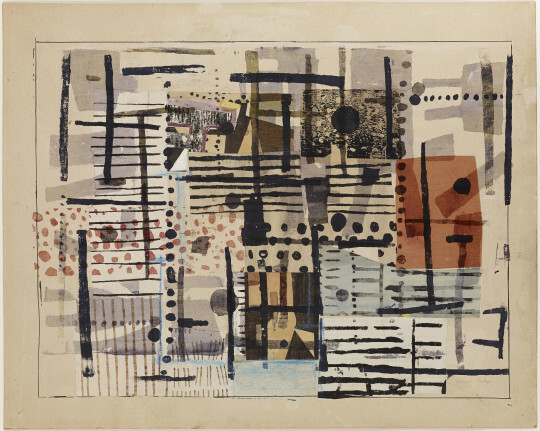 These collages were to provide the basis for large scale collage murals made during the first half of the 1950s when Paolozzi was involved with a number of architectural projects. In 1955, based at Landsmere Quay, Essex, he founded Hammer Prints Limited with the artist Nigel Henderson, to produce designs for textiles and wallpapers, and later ceramics; the venture lasted until 1961.